Branwyn St. Clair is running from her wicked stepfather when she stows aboard the first ship she comes to. Little does she know it is the infamous elven pirate ship, the Moonbeam. When cabin boy, Johnny Pate finds her in the hold, they form an uneasy alliance. 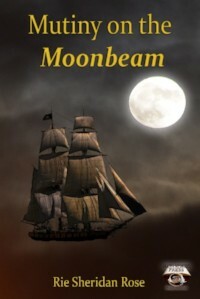 Life aboard the Moonbeam is not what she expects. The ship soars through the clouds in search of plunder But the biggest theft of all has already occurred… Filled with unusual characters and thrilling adventure, Mutiny on the Moonbeam offers something for everyone.